Tired of your email design? Looking for a way to make your message pop? Animated GIFs might hold the answer. Adding a GIF to your email can help your message stand out and entice your subscribers to take action. Let’s take a look at some example GIFs and how you can create one for your next email. The origin of the animated GIF. In the wild and woolly 1990s, the animated GIF was born. It was a time when web designers and developers were so preoccupied with whether or not they could, they didn’t stop to think if they should. Animated GIFs were quickly derided as the clear sign webpages were created by someone with little talent or taste. One of the reasons for the scorn was that the GIFs were often distracting. Webpages were awash with dancing babies, flashing police lights, and waving flags, none of which had anything to do with the webpage itself. 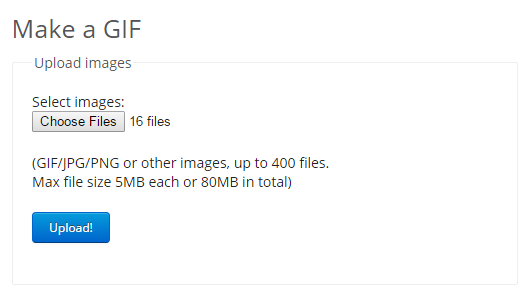 Additionally, the GIF image format had both limited color depth and a large file size in the non-animated form, and animation just ballooned the size. In the end, animated GIFs took too long to download and had poor image quality. The evolution of animated GIFs. Now, two decades later, the animated GIF has taken on a much different significance. GIFs that used to be limited due to the low available bandwidth are now reasonably sized for modern broadband and 4G wireless connections. Designers have also largely developed an understanding of how to incorporate the animation into website and email design. 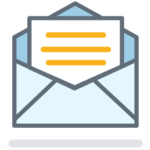 Many email clients display animated GIFs in both foreground and background form. Foreground GIFs take on the jobs of slide shows, silent video clips, and short animations. Background GIFs provide a dynamic look to a static email. If you’re using Constant Contact, you already have access to a few animated templates. Search “animated” in the email template picker to preview your options. Use GIFs within your email body to entertain your readers and express how you feel about something. Tumblr and Twitter are rife with these moving memes, and even Facebook has bowed to pressure to allow them. Or, add a GIF to illustrate how to use your product. How to make an animated GIF. The GIFs in the examples above were made using Giphy, a public website that will create a GIF from a YouTube or other video for free. Once it’s created, you can download the GIF and add it to your image library. To use Giphy to make a GIF from a YouTube video, just copy the video URL and paste it at the above link. Choose the starting point, the length (3 to 5 seconds is recommended), and add a caption. Click “Create GIF”, and after it processes, you can right click on the GIF and save it to your desktop. Once saved, you can add the image to your email, just as you would with other file formats. Add accents with background GIFs. Another good use for an animated GIF is as a background image. Just stay subtle so you don’t distract from the focus of your email. I built this 16 frame GIF using freely available tools online. I created the individual frames using Pixlr, an online image editing tool that allows layers, and then I put the images into GIF form using EZGIF, an ad-supported third party site. You can also use desktop tools like Photoshop (which is not free) and GIMP (which is). Once you’ve created your frames in your image editor of choice, it’s just a few clicks to create the GIF. 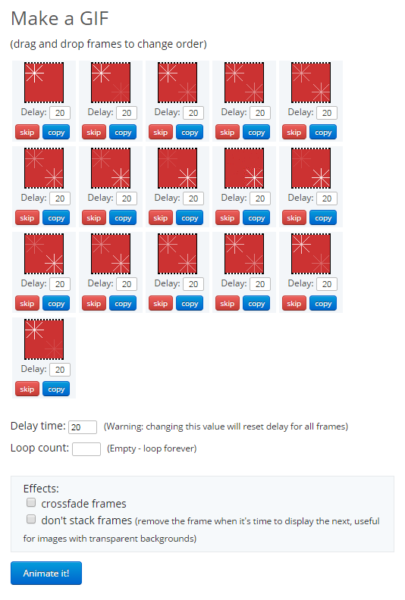 On EzGIF, click Choose Files, select all of your frames (use Ctrl-Click or Shift-Click to get all of the frames at once) and click Upload. There are several settings here you can adjust, but your first time through, just click the “Animate it!” button. Scroll down to view your completed GIF. You can then right click on it to save it to your desktop. Click on the image box under “Outer Background Color”, select the image from your library, and insert. And that’s it. Easy-peasy! You can check out a sample email using this GIF as the background here. Inspired to add animation to your emails? A little animation can go a long way in making your next email stand out. Log in now to give it a try! Not using Constant Contact? Try us out with a free 60-day trial.